And, of course, one cannot talk about Sligo, about this Irish land, without saying that this land is called the land of William Butler Yeats, the great son of the Irish people, the poet, the Nobel Prize Winner. A native of Dublin, he always spent his childhood years here, in the family of his relatives, and later, becoming an already world-renowned poet, again and again came to Sligo to find poetic inspiration. When, after a failed search for the Spanish brigantine, being in the western part of Ireland on the instructions of the editorial board, my colleague and I from the newspaper decided to return to Sligo. But on a narrow mountain road in the mountains, it was impossible for two cars to disperse and had to cuddle up to the very edge in order to skip the oncoming car or move backwards, like a cancer ... The feeling was as if we had fallen into an impassable jungle and that time had stopped Ringing silence and indescribable I felt peace everywhere on our way. And suddenly, behind the age-old trees, before us arose a huge and majestic lake, stretched among the mountains ... We left the car to stretch our legs and look around. At that moment I did not even immediately realize that fate itself led us to the lake, which William Yates sang and to whose sources he returned all his long life, to Lake Lough Gill. .. Tourists seem to have been here from all over the world ... An excursion to the castle or by boat, whatever you wish. I did not want either one or the other - I stood and looked at the lake, which inspired the poet. ..” "If I were a blackbird ..."
Turn off the TV set, set aside your household chores for a minute and wait a while with shopping, people do not live by bread alone. 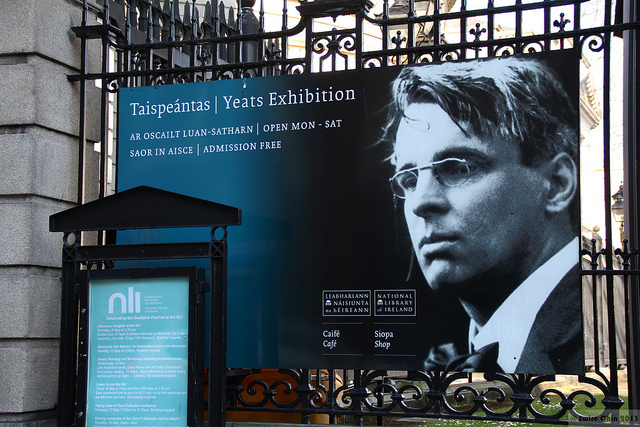 I invite you to meet the poet William Butler Yeats and devote a few minutes to his inspired life. Yeats’s manuscript collection at the National Library of Ireland is one of the greatest literary collections of the poet in the world — it includes poems, plays, stories and short stories, articles, essays, political and literary speeches, lectures and radio scripts, diaries and letters ... The poet lived 74 years, and lived as he understood his purpose in this world. According to his biographer, Yeats lived several lives, inseparable from the development of poetry and the awakening of the spirit of Irish self-consciousness. “I spent my whole life clearing every phrase written for the eye from the poetry and returning back to the syntax of what was created for the ear. Write for the ear, I thought that you should be understood, as an actor or a folk singer, standing on the stage in front of the audience, will be understood''. “Genius is talent, multiplied by hard work,” said one of the ancients. Traveling a lot, he sought inspiration in his native Ireland and very often came home and stayed in the castle of his close friend, Lady Gregory. In discussions about literature with her and other poets and writers, the idea of ​​creating an Irish literary theater was born, which was later renamed the Abbey Theater in the name of the street. The Abbey Theater opened the first season in 1890 ... The work for the theater absorbed all the time and the poet's strength, Yeats wrote and staged several of his plays on the stage. This topic is so extensive that you can write a lot of the most diverse articles about the poet, but I’m polanging and I hope that having learned something more about the great Irish poet, after reading this short article, you will visit the places where he has been, worked and created for us. So that our life would be something big and filled with beautiful poetry ... whether it, William Yeats, or the poetic lines of other beautiful poets.